A passenger with restricted mobility is a person whose mobility is reduced due to physical incapacity (sensory or locomotory), an intellectual deficiency, age, illness or any other cause of disability. After completion of the check-in by the ground handling staff, these passengers will be accompanied from/to the aircraft and will be assisted when (de-)boarding. At Corendon Airlines, disabled and ill passengers are given special attention. So that they can travel in as convenient and comfortable a manner as possible, their special needs should be indicated and arranged prior to departure. Mobility restricted passengers who have booked their travel through a travel agency should inform their agency or info@corendon-airlines.com of their handicap and request an acknowledgement regarding their special needs. Corendon Airlines requires a minimum of 48 hours to organize the necessary assistance. If a request reaches Corendon Airlines less than 48 hours prior to departure then it may not be possible to arrange the necessary assistance and as a result, the passenger concerned may not be able to travel. For safety reasons, disabled passengers and passengers with reduced mobility cannot be seated by emergency exits. The cabin crew may change the seat given by the check-in staff to the disabled passenger to a more suitable and convenient seat in the cabin. In general, passengers with restricted mobility will be given window side seats (A/F). Other seats can only be assigned by the check-in staff after evaluating the physical condition of the passenger. WCHC (Wheelchair – C for Cabin Seat): Passenger is completely immobile, can use passenger seat with back rest in upright position, is unable to overcome distances alone, e.g. in the cabin to/from seat and to/from toilets – paraplegia/ hemiplegia, multiple sclerosis, etc. On the request of a passenger, a wheelchair service will be provided free of charge by Corendon Airlines. To have a wheelchair transported, you need to inform info@corendon-airlines.com at least 48 hours before departure and request confirmation for transportation. The dimensions of a mobility device must not exceed 86 x 86 x 86 cm. The passenger needs to hand over the wheelchair, properly packed for transportation in the aircraft, at the counter before departure. Ground operation personnel do not have the equipment to disconnect the battery or charger from the chair. You will need to make your mobility device ready for travel yourself and remove the battery from its position. 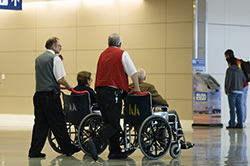 The wheelchair should be presented at least 2 hours prior to departure at the check-in counter, so that we can prepare your mobility device for transport. Battery driven wheelchairs, with non-spillable, dry cell or wet cell batteries can be carried as checked-in baggage in the aircraft hold compartment provided that the battery is disconnected and securely attached to the wheelchair and the poles are insulated. If a wheelchair cannot be loaded, stowed, secured and unloaded in an upright position, the battery must be removed and checked in separately. For transportation, the battery must be put into a plastic bowl or plastic bin to prevent contamination and corrosion of the hold compartments. Passengers with a hearing disorder are given priority by ground handling staff during check-in and boarding. Small notebooks are available in the cabin for the crew to communicate with the passenger if needed. These passengers cannot occupy aisle and emergency exit seats in the aircraft for safety reasons. One-to-one briefings are given by the cabin crew regarding safety rules. In addition, cards with safety instructions in braille are available in the cabin. Passengers with a vision disorder cannot occupy aisle and emergency exit seats in the aircraft for safety reasons. • It must accompany a blind passenger who is dependent on the dog. • The guide dog should be properly harnessed, muzzled and lined and the relevant equipment should not be removed during flight. • The guide dog should sit at the passenger’s feet at a window seat and never at an emergency exit or aisle seat. • The guide dog should have valid vaccination papers. • Has a contagious/infectious disease, e.g. chicken pox, open tuberculosis, infectious hepatitis, scarlet fever, diphtheria, measles, or any other disease spread by air or touch. • Has suffered a heart attack or stroke in the eight weeks leading up to departure. • Requires medical attention using pneumatic or electrically operated apparatus which, for specific reasons, is not allowed on board. • Is under the influence of drugs and alcohol to the extent that the safety of the flight may be endangered. If passengers do not declare their illness before their flight, they will fly at their own risk and responsibility.